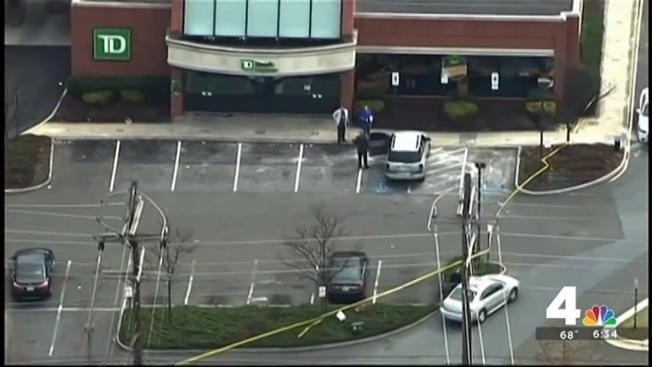 Prince George's County police say a man believed to be linked to at least nine bank robberies in Maryland used notes that included the hashtags #nopolice, #becarefull (sic) and #afterwork?. Leroy Earl-Morris Daley, 45, likely will be charged with five bank robberies in Prince George's County, police announced Friday. The robberies all occurred between September 2015 and March 2016. The most recent robbery was reported Thursday on the 8200 block of Annapolis Road in New Carrollton. Police believe Daley also is responsible for three bank robberies that occurred in just 15 minutes in Montgomery County. Daley was arrested Thursday after a police officer spotted his car right next to his police cruiser. Prince George's County Police Sgt. Craig Winegardner investigated the bank robbery in New Carrollton and had just finished lunch at Woodmore Towne Centre in Glenarden. "After finishing lunch, I walked over to my cruiser ... parked right next to my cruiser was the suspect vehicle," he said. "I saw a dent on the back bumper and then I saw the color of the car. [I saw] every identifying feature that Montgomery County sent us." Winegardner called for backup and surveillance. "After about 5 or 10 minutes of surveillance, the defendant walked out to get in his vehicle, still wearing the same clothing from our bank robbery," he said. Daley walked out of an eyeglasses store, police said. In the Prince George's County cases, police say Daley passed notes to the tellers demanding money. Those notes included the hashtags #nopolice, #becarefull (sic) and #afterwork?. A skull and crossbones emoji was placed behind the #afterwork? hashtag. It wasn't immediately clear if Daley had an attorney. Anyone with information that can help police is asked to call police at 301-772-4905.